The Process of Social Research successfully meets two major challenges of teaching social science methods: to make the material interesting and accessible to students, and to provide them with the tools necessary to understand, evaluate, and conduct research. Authors Jeffrey C. Dixon, Royce A. Singleton, Jr., and Bruce C. Straits employ a conversational writing style that is engaging and student-friendly. Using everyday examples to introduce chapters and clarify complex concepts, they provide current research examples on such cutting-edge topics as immigration, family composition, prosecutorial misconduct, organized racism, homelessness, social inequality and education, and alcohol consumption and grades. 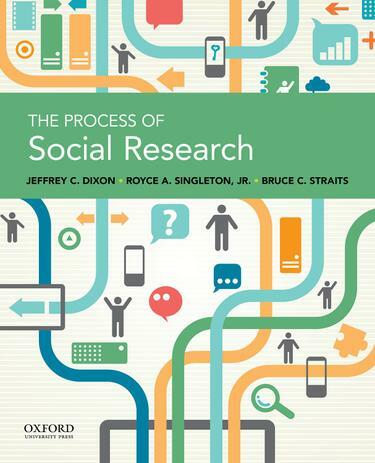 Placing a unique emphasis on the research process, the book helps students understand the logic and mechanics of social research, giving them the tools and the power to evaluate the research of others and to conduct their own research. Beginning with the introduction, every chapter contains flowcharts of research processes. As each diagram is presented, the authors relate the specific method to the overall research process. Then, over the course of the chapter or section, they flesh out each step. This way, they convey information about the "nuts and bolts" of research while ensuring that students do not lose sight of the logic of inquiry. Comprehensive and up-to-date without attempting to be encyclopedic in its coverage, The Process of Social Research provides a balance between qualitative and quantitative research, taking a more integrated approach to describing the relationship between theory and research.